Game developer Crystal Dynamics has rebooted the 20-year-old Tomb Raider story, recasting pop culture icon Lara Croft as a young researcher trapped on a deadly island following a shipwreck. Crystal has dialed back her statuesque proportions, once embodied by Angelina Jolie on the big screen, and put more emphasis on plot and character as Lara traverses the island in search of other survivors. "Thanks to high-end graphic and sound design, big-budget console games like Tomb Raider can be quite cinematic," writes NPR's Glenn McDonald in a glowing review. "They can work like movies. When attention is paid to classical narrative virtues — story, character, atmosphere — the gaming just gets better." • Panoramas allow users to explore the real-life Crystal Dynamics studios and virtual island environment by moving their iPads in the air. • There's an interactive replica of the musical instrument that was invented to produce the Tomb Raider soundtrack, and a virtual mixing console that helps the user better understand how separate music tracks are blended together to make that soundtrack. • The evolution of Lara is painstakingly presented, with an interactive timeline, rotatable 3D models, concept sketches and a slider that shows how the fictional Lara compares to the real-life model on which she was based. • We've baked in plenty of opportunities for Tomb Raider fans to interact with the app — real-time polls; a community section where fans can chat; and a form for signing up for mailing-list updates. • There are exclusive photo and video galleries that take users behind the scenes of the development process, explaining how story arcs are crafted and recrafted until they are included in the final game. • And there are the usual surprises — spoiler alert: beware of the creepy crawly spider near the end of the app! We produced both tablet apps using Adobe Digital Publishing Suite, the platform on which we create most of our apps. This is the third app we've made with Geoff, following The Final Hours of Mass Effect 3 and The Final Hours of Portal 2, which Fast Company described as "pushing the limits of storytelling" and "a model for publishing a la carte journalism as apps." "Joe and his team are, in many ways, co-authors of these apps," said Geoff, who hosts GameTrailers TV on Spike and is the executive producer of the Video Game Awards. "Tomb Raider is our deepest collaboration yet. I'm thrilled with the end result and can't wait to continue innovating in the app space with JZD." • The Final Hours of Tomb Raider website showcased an episodic video series (that's also featured within the app). • Amazon released a one-chapter teaser of the app last fall; and offered free copies of the app to anyone who preordered The Final Hours Edition of the boxed Tomb Raider game from their website. • The Final Hours of Tomb Raider television special, hosted by Geoff, aired last night on Spike. • We worked with Haneke Design to develop a desktop version for Steam, a gaming network with more than 54 million users, so that those without tablets wouldn't miss out on the experience. 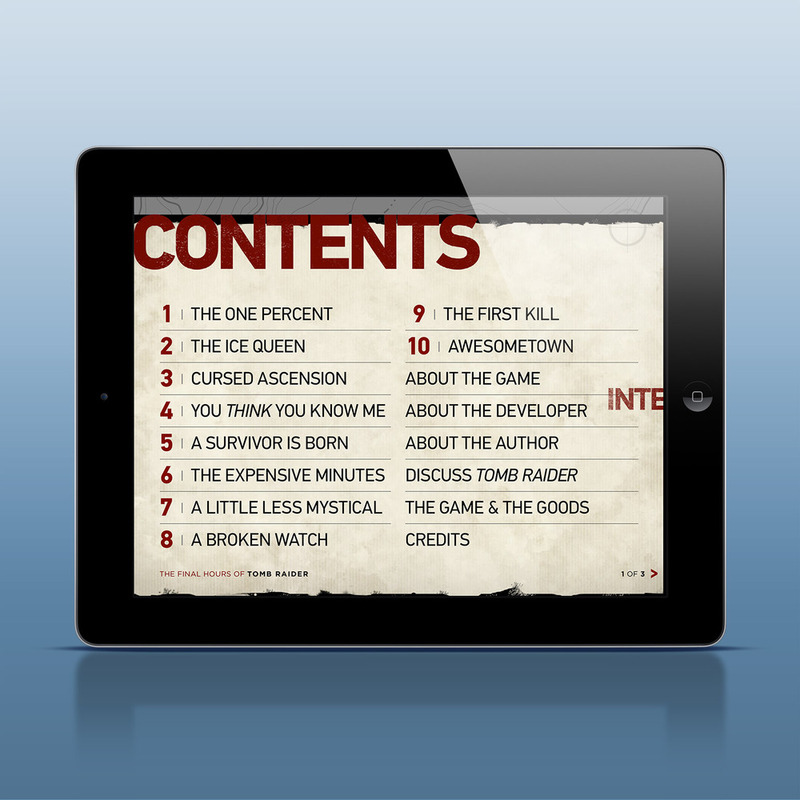 The team at Haneke labored around the clock to produce a near-exact replica of our iPad app that plays on Mac and Windows computers. Many thanks to Geoff for entrusting us with another amazing Final Hours project; to Karl Stewart, Rich Briggs and Sam Goldberg at Crystal Dynamics; Jody Haneke, Dan Hoffman, James Landrum, Aleks Vasic, Jesse Curry and David LaMarre at Haneke Design; and to the team at JZD, in particular Christopher Holewski, Ed Gabel, Josh Penrod and Ian Brown who worked tirelessly to make this project a success.